For some reason this week has seemed SOOOO long. So TGIF! We don't have much a weekend planned, which is probably a good thing, since we're due to get MORE snow on Sunday. I'm ready for spring. Being stuck inside with a newborn and toddler is less than ideal. We're coping as best we can, but I think we can all agree that life with a toddler is much more enjoyable when said toddler is able to run around outside thus producing LOOONG afternoon naps. Bring on the grass, trees, pollen and bees. 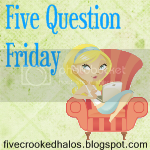 Well, not the pollen and bees :)I decided to link up with Mama M. today for 5QF... enjoy my answers (these were fun questions!). We met at U of A my freshman year. We were friends long before we ever started dating. Our first date was at a bar (he disagrees, but look, if you pay for a girls cover charge and pay for a soda for her, then it's a date!). Two days later we had our second date, and I knew then that I would marry him. Weird, I know. But I did. My bedroom. I love our furniture, and I love our bed. It's the one peaceful place in the house! No! Can people really do that? Weird. Not really sure I have one, besides bathing the kiddos and putting them to bed. Although right now I would say our ritual is putting the kids to bed and then working out together (Drew and I are doing P90x). Atleast 8. Which is laughable at the moment considering I have a 9 week old and a 21 month old. Not much sleep going on at my house. Although Connor does give me about 6 hours a night, so I guess I shouldn't complain too much!